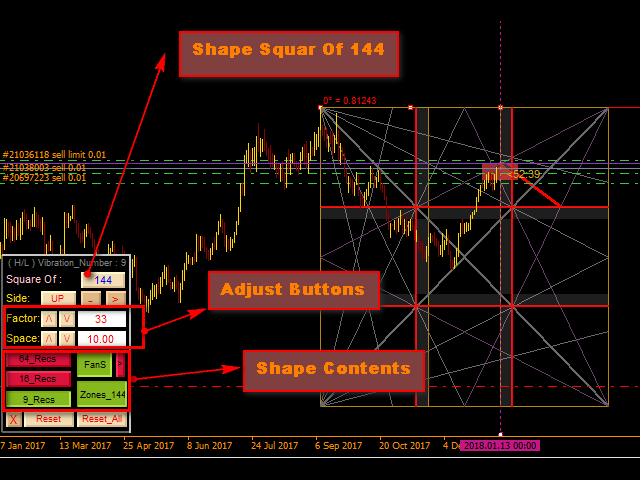 This indicator is a market analysis method based on the "Mathematical formula for market predictions" article written by W.D. Gann depending on square of nine and square of 144 methods. Move between SQ9 and SQ144. 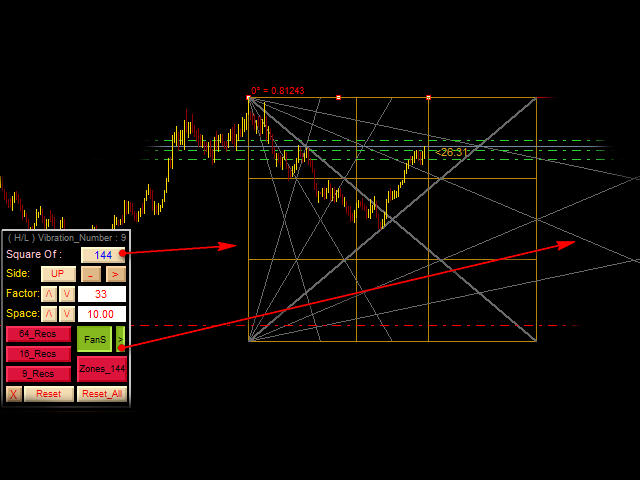 Choose perfect style to trade on (Levels, Channel, Star, GannFan, Circles, and Grid for SQ9). Choose Angle /Time/Space (Square Of 9 Basics). 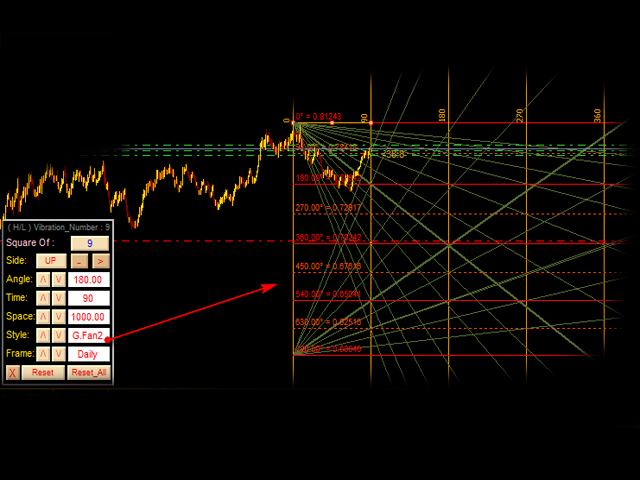 View Higher Time Frames Analyzes On Current chart By Using Frame method. In extended panel there is an alarm button by activating it you will be notified on time/price lines. 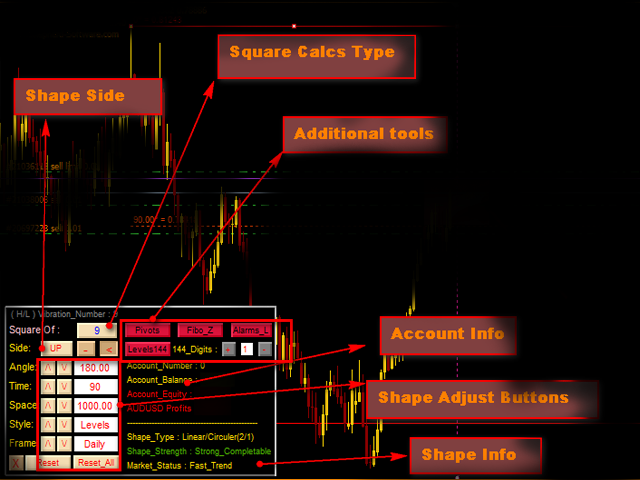 In extended panel you will description of your detected SQ9 Style (Type /Strength/Markets status duo to this shape). 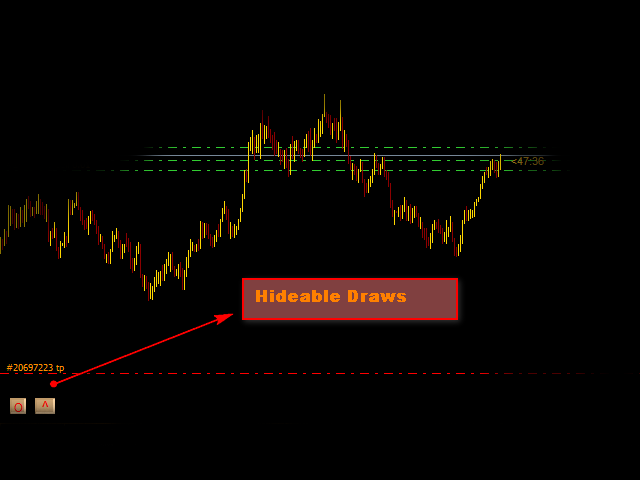 You can hide all of indicator drawings from Close Button. 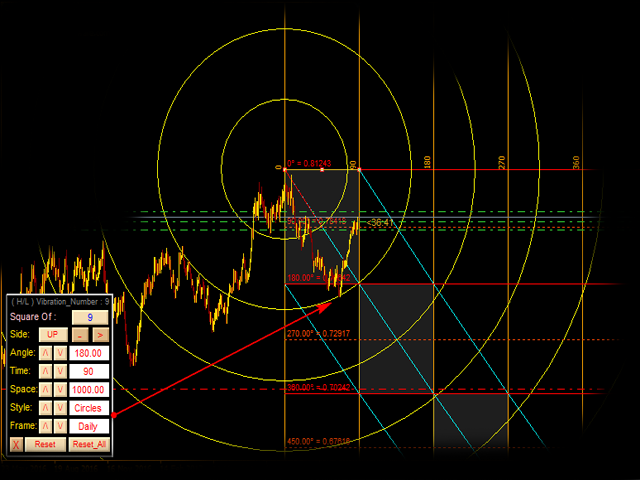 Every line works as a support/resistance as Gann explained in his books. The free version only draws square of 9 calculations. Use_System_Visuals - Enable\disable System Template. Auto_Detect_H_L - Enable\disable detection of high/low automatically. Relate_Time_With_Angle - Enable\disable relates angle and time. Rotation_Count - Number of rotates for square of nine levels. Show_Prices_At_Left - Enable/disable prices on the left. Show_Prices_At_Right - Enable/disable prices on the right. 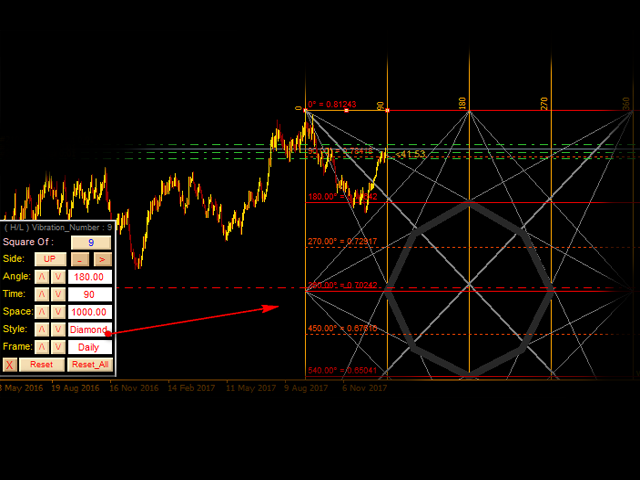 Position_Of_Right_Prices - Position of text of angles depending on chart start. Show_Basic_Fans - Enable/disable basic fan only in G.Fan style. Show_Time_With_Fan - Enable/disable time separator with fan. Rectangles_Color - Color of channel rectangles. Arcs_On - Applying arcs on (0=Time&Price/1=Time /2=Price). Star_Color - Star line color. Star_Width - Star line width. SQ144_Color - Square of 144 color. Show_Time_Separator - Enable/disable square 144 time separator. Time_Sep_Color - Square Of 144 time separator color. Square of 144 Fan lines (Color/Style/Width). Sub_144Fan - Enable/disable square of 144 sub fan showing. Rectangles_9(16/64)_Color - Color of 9 (16/64) rectangles. Rectangles_9(16/64)_Style - Style of 9 (16/64) rectangles. Rectangles_9(16/64)_Width - Width of 9 (16/64) rectangles. Price_Time_Zone_Color - Contracted Zones Color . 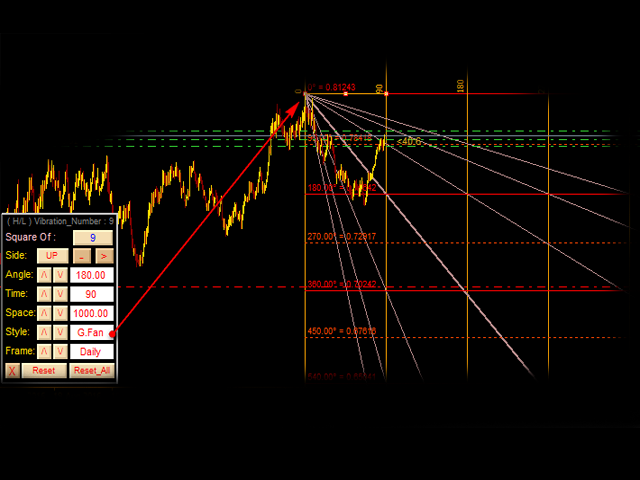 Fibo_Zone_TF - Period Of Fibo Zone. Fibo_Zone_Color - Color Of Fibo Zone. Show_SQ144_Sub_Levels - Enable/disable SQ144 SubLevels . Pivot_Time_Frame - Period of pivots . Show_Levels_Name - Enable/disable names of pivots levels. Show_Pivot_Line - Enable/disable showing of pivot level. Pivot_Line - Color of pivot level. 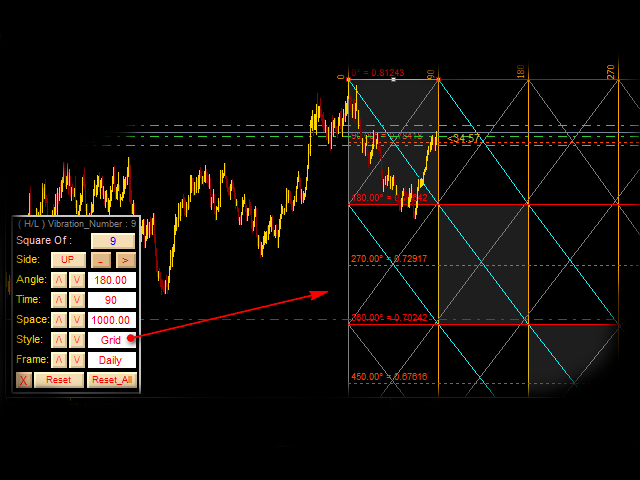 Show_SR_Levels - Enable/disable support and resistance pivot levels. Support_Line - Color of pivot support levels. 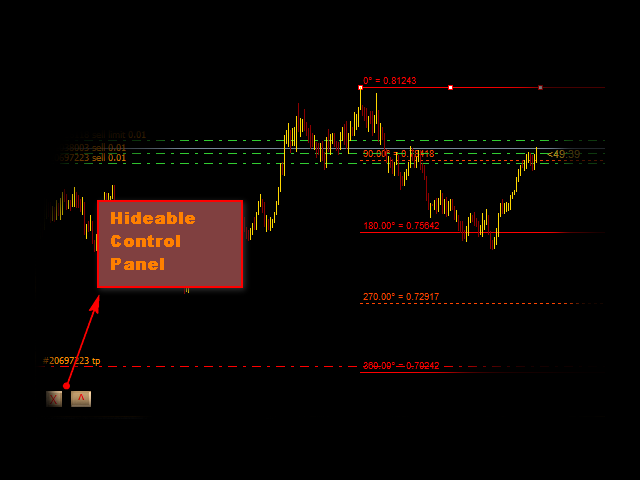 Resistance_Line - Color of pivot resistance levels. Pivots_Font_Size - Pivot text font size. Push_Notification - Enable/disable push notifications. 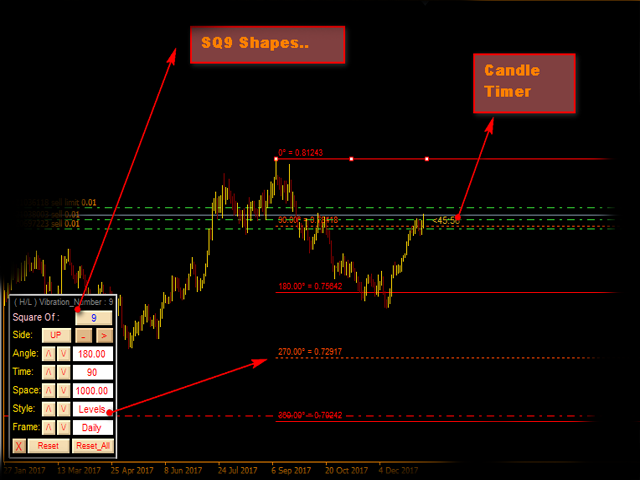 Show_Last_Candle_Counter - Enable/disable candlestick remaining time counter. - Improvements for indicator saved data. - Data entry from the panel is now easier. 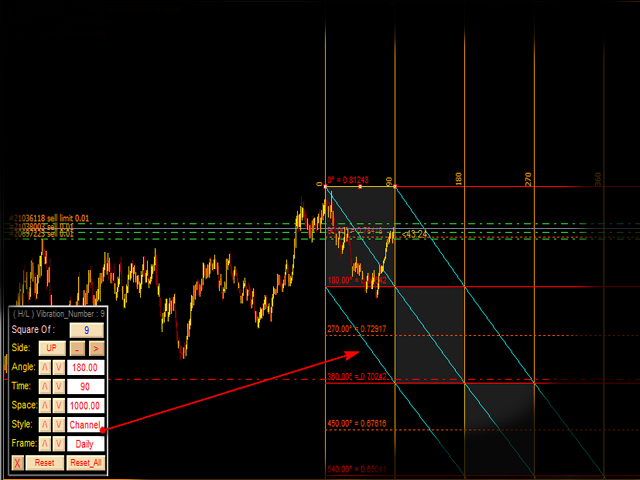 - Added SQ9 Intraday Levels. - Improve Candle Time Remaining function. - Bug fix in square of 144 spacing. - Bug fix in space zero divide.